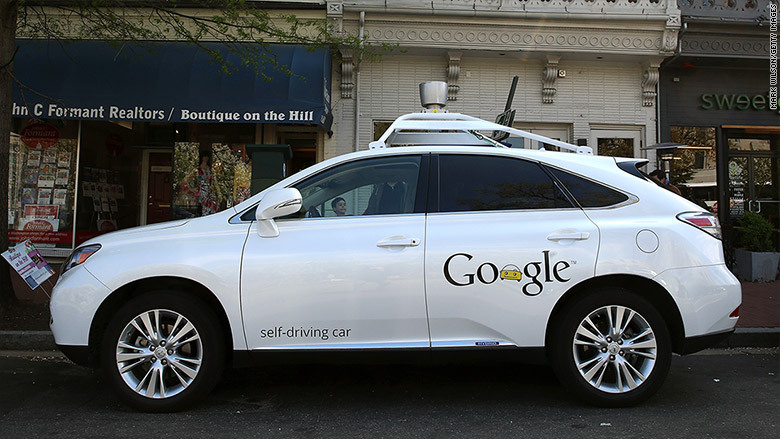 Google is having some technical difficulties with its driverless cars. Or perhaps they’re having human difficulties? Okay, here’s the story: according to a University of Michigan study, self-driving cars are getting into twice as many accidents as human drivers. None of the accidents so far have been serious ones. What’s happening is that human drivers are crashing into self-driving cars, mostly in low-speed rear-end collisions. It seems that the driverless cars are too scrupulous in obeying traffic laws, and too quick to slow down or stop when there might be a problem, such as a pedestrian who might step into the street. Human drivers, on the other hand, are less finicky about the rules of the road. Humans expect other drivers to be more aggressive. They crash into the driverless cars precisely because self-driving cars don’t act like the average human driver. So it’s all the fault of the human drivers, right? Well, Google and other self-driving car makers can rightfully claim that their cars are not legally at fault when they get into accidents. After all, they are programmed to scrupulously obey the law. It’s the human drivers crunching into them who aren’t obeying the law—or are just not driving as attentively as they should be. In the very act of designing and programming its cars, Google and other self-driving car makers are learning by experience that there’s a lot more to driving than following the traffic laws. The rules of the road are an important player in that game. But an even more important player is the other drivers on the road, and their psychology. A good driver is not merely one that knows the traffic laws well and follows them diligently. As virtuous as that may be, a good driver is also one who adapts and adjusts to the other drivers on the road in order to get everyone from point A to point B safely. For example, if the speed limit is 65 mph, but almost everyone on the road is going 70-75 mph, driving 65 is not necessarily the best and safest thing to do. A slower driver—even one who’s actually driving the speed limit—causes cars to bunch up behind it. That makes accidents more likely. Of course, no one would get ticketed for driving the speed limit. Technically, it’s all those evil speeders who are causing the accidents. And yet . . . sometimes “going with the flow” actually is the right thing to do for everyone’s safety. You see, there are the rules of the road, and then there is the way people actually drive. People are not robots. We don’t just do what we’re programmed to do. Quite often we know very well what we’re supposed to do, and we simply don’t do it. The ability to make personal and moral decisions about when we will and won’t follow the law is precisely what makes us human. When we’re out on the road, this human reality comes into full force. Since everyone on the road (except motorcyclists) is encased in a big steel and glass box, it’s easy to think of those other big, moving things on the road as just vehicles, forgetting that there are human beings inside of them. Human drivers must continually assess the character and personality of the other drivers on the road, as expressed in their driving. And when another driver does something unexpected and dangerous, human drivers must make split-second decisions about how to react and what to do. Humans will make those decisions based not solely on safety and the law, but also on their own character, personality, and values in the context of the particular situation they’re in. Some will think only of saving their own skin. Others will do their best to save the life and limb of others, sometimes even at the expense of their own. To use an example from the MSN article, would you sacrifice your life by swerving off a cliff to avoid killing a school bus full of children? Do you want your robotic car to make that life-or-death decision for you? This is all part of the social game of driving. Traffic laws exist in connection with—and often in tension with—that very human social game. Why do we make traffic laws in the first place? The purpose of traffic laws is to keep people safe on the road, and get them from point A to point B in the most efficient and safe way possible. If there were no stop signs or stoplights, together with laws requiring drivers to stop at them, every busy intersection would be a messy free-for-all. Traffic would quickly get snarled up, and accidents would proliferate. Stop signs and stoplights are meant both to keep people safe and to get traffic flowing through intersections as efficiently as possible given that there are many different drivers going in many different directions. So the letter of the law is that drivers must stop at stop signs and at red lights. But the spirit of the law—the reason the law was passed in the first place—is to get the mass of drivers to their destinations as safely and efficiently as possible. What happens when the letter of the law violates the spirit of the law? What if you’re merging onto the highway, and everyone is flying by at 75 mph in a 65 mph zone? Does it get the mass of drivers safely and efficiently to their destination if you merge onto the highway at 65, and cause a pile-up in the process? What if you’re stopped at a red light, and an ambulance comes up behind you, lights flashing and siren blaring? Should you obey the red light and sit there blocking the ambulance, even though all of the cross-traffic has stopped to let it pass? That ambulance must get to its destination as quickly as possible! What if you’re driving down a two lane highway and an oncoming car suddenly veers into your lane? Should you really obey the law and carefully avoid crossing over the double yellow line, even if it means getting into a head-on collision? Whether a traffic problem that a human driver is facing is caused by other humans breaking the law, or by emergency vehicles, or even by another driver having a sudden heart attack and losing control of the vehicle, acting in order to not get into an accident and in order to get people to where they’re going safely is more important than following a specific traffic law in a specific situation. In other words, where there is a conflict between the letter of the law and the spirit of the law, we should act in such a way as to accomplish what the law was meant to accomplish—even if that means technically breaking the law. Self-driving car makers are going to be tearing their hair out over that one for many years to come. While many, if not most ordinary situations on the road can be dealt with by following the traffic laws, quite often something like human judgment is required. And that’s not an easy thing to program into a robot. We humans do our best (sometimes . . .) to pass laws that will protect us from one another and ensure a reasonable level of justice and fair-dealing in human society. And though there certainly is some divine inspiration behind our many religious laws, including those in the Bible, even they must be accommodated to fallen and imperfect human beings. There are many laws in the Bible that we no longer follow because we recognize that the social conditions for which those laws were given no longer exist in today’s society. So when we look at laws, whether secular or religious, we must ask ourselves the question: Why were these laws enacted? What good things were they intended to accomplish? What bad things were they meant to avoid? When we consider whether to keep, bend, or break a particular law, we have to ask ourselves the same question: Will obeying this law right now accomplish what the law was intended to accomplish? If the answer in a particular situation is “no,” then keeping the letter of the law would mean breaking the spirit of the law. Now, none of this should be taken as a license to go around breaking any laws we please. Yes, there are plenty of bad laws in our world. But for those of us who live in fairly decent civil societies, most of the ordinary laws we deal with in the course of our daily life, such as traffic laws, were passed for good reasons, and have a proven track record of keeping people safer, happier, and healthier than they otherwise would be. Unless we have a good reason to do otherwise, the default should be to obey the law. And yet, we are human precisely because we have the ability to evaluate laws and make a decision that in this particular situation, for the good of everyone involved, it would be better to break the letter of the law in order to keep the spirit of the law. Driverless cars cannot make these decisions. They must be made by the human beings who program them. And with that, we wish you happy driving and safe travels! Is Wealth a Blessing or a Curse?